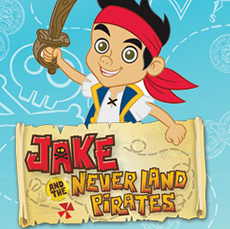 Our removable Jake and the Never Land Pirates wall stickers are sure to delight any little treasure hunter. Your favourite characters like Jake, Izzy, Cubby, Captain Hook, and Mr. Smee will bring action, adventure, and fun to any room. Decorating with Jake and his friends is an easy process. First, choose your design from our selection of wall stickers, giant wall graphics, or even an interactive Jake growth chart. Then simply peel & stick to get it on your wall or flat surface of choice. When it's time for a change, don't fret: just peel the design away and move it to a new spot. Your child will love how easy it is to use these wall decals in their bedroom or play area.